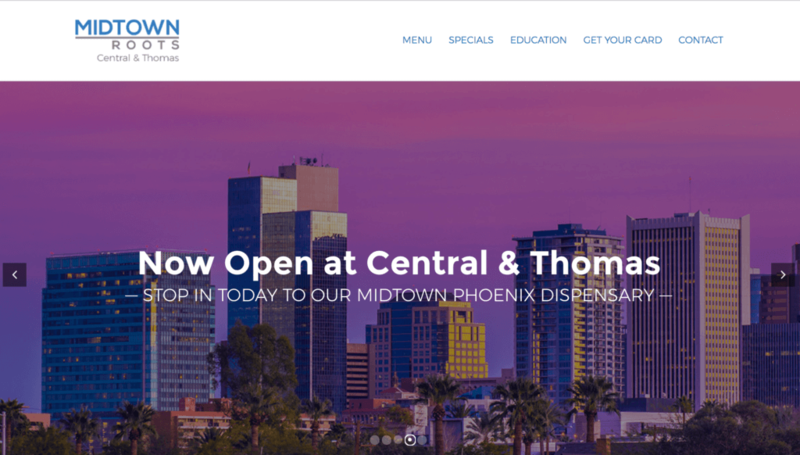 In early August we launched a modern and elegant new website to coincide with the grand opening of Midtown Roots, a new medical cannabis dispensary in midtown Phoenix. The new site is fully responsive for optimal viewing on desktop and mobile browsers, and it features some interesting custom functionality developed by Eight Trails. The slideshow on the home page, which you can see in the featured image above, automatically pulls images and text from two different post categories: Specials and Slides. Specials are promotions or events that are date sensitive, and when those are created by a Midtown Roots employee as a WordPress post<—>with simple text and point-and-click image uploading<—>they automatically appear on the Specials page, as well as creating a clickable slide on the home page. And when the promotion reaches its end date, both the post and the home page slide automatically disappear from the site. Slides are also created as posts in WordPress, but they don’t appear on the Specials page and because they are not date-specific they don’t expire automatically. Eight Trails built this custom functionality so the Midtown Roots staff could create attractive slides for the home page without needing a separate design program. Also on the site are an embedded menu with online ordering, which pulls product information from the Baker database and displays it in a searchable, sortable, and filterable listing of product names, prices, and ratings (shown at right), as well as an extensive education section detailing the medical benefits of cannabinoids and terpenoids, the primary components of medical cannabis (shown below). Eight Trails provided website planning, writing, design, and development, managed WordPress hosting and ongoing site management, SSL protection, and assistance in setting up an email promotions system and embedding its signup form on the site. Can we help you take your website and online advertising to a higher level? Contact us today!